Venture into the depths of a neuroscientist's mind in the bonus game! Find hidden shadows and learn more about their diabolical origins in the Shadow Encyclopedia. Remember those you hold dear as you collect heartwarming family photos. Hit a dead end? Feeling stuck? Check out the strategy guide! 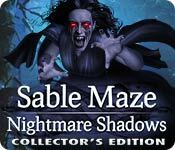 Sable Maze: Nightmare Shadows Collector's Edition is rated 3.7 out of 5 by 24. Rated 5 out of 5 by kerith90angel from This is my favorite game of 2017 BASED ON COMPLETED GAME (and extras) SE portion took me: 3 hours 50min. CE bonus play: 1 hour 15 min. Total play: 5 hours 5 min. The Walkthrough Guide is 44 pages and the CE bonus play is 8 pages of gameplay. The chapters in this game are broken up into different places and times so the color scheme also changes from night to day, indoor to out. I love when a game changes the time of day to mix things up a bit. If I could I’d rate it higher than 5 stars. The fear factor in this game is perfectly balanced. You are lulled by a beautiful garden scene with happily chirping birds and Bam! The shadow people are scary! They are perfectly done. This game kept making me jump in my chair!! This is what I loved most. It’s so scary when you are caught off guard. 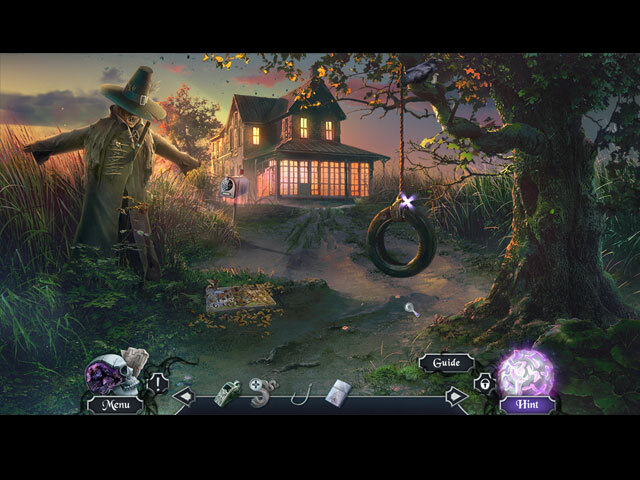 Most horror light games are in dreary locations or at night. When a game can still be scary during bright light, it is just ingenious! The amount of thought and detail that went into this game is obvious from beginning to end. I tried to play other games during this one so it wouldn’t end. I haven’t done that with a game since Paranormal Pursuit The Gifted One. Even the 3D map is a work of art. This portal, task map is easy to read and transports you quickly. When I got to chapter 5 “Forest Road” I was thinking to myself what a power house Daily Magic has become to BFG. Most of the HOP were very detailed rooms and organized. There is a HOP in Chapter 5 called “The Toy store”. It leaves you to just stop and stare at all the detail and effort that went into this scene. I can’t believe it wasn’t in the demo. Whoever was responsible for this amazing scene, hats off! Chapter 6 has an area called “The Old Church”. It is just so beautiful with sun rays streaming through the forest and fireflies bouncing around. I was happy to see this scene is a Wallpaper that is offered with the CE. For the most part I don’t like the tinker type of MG. I prefer the game related kind that are interactive and I don’t get frustrated with. I did play most MG in this game which says a lot for me to finish that many. The photos, notes and articles you see are the best I’ve seen in casual gaming. It is just another thing to show the amount of time and effort that went in to perfecting it. I mostly liked the music in the HOPs. There was one track that sounded like the theme to Charlie’s Angels (though it is not one of the 4 tracks offered with the CE). RE: BONUS PLAY: This bonus play is worth your buck in my opinion! I loved it. You play as a male this time, named Henry Olney (Sc. D. Neuroscience Society) He is investigating Mr. Reynal (dude you played as in the main game). Henry is trying to verify the theory of the Dreamlands. Technically, it’s the study of Lucid Dreaming. You continue collecting all the same items in bonus play. You play in 8 NEW AREAS in the bonus play. ALL OF THE BONUS PLAY IS NEW! Usually, I will list “old revised” areas in a completed game compared to “new” areas in bonus. It is a rare thing to see all new areas. I counted 20 mini games (I only skipped 2). I believe there are only 3 HOP scenes in the bonus to play which was a bummer, because I prefer HOP to MG. Bonus play takes up 8 pages of the 44 page strat. guide. The end cut scene to bonus play is-- WOW! I highly recommend the CE for the bonus play. If you liked this game, try the demo’s to these as I feel they are similar in one way or another. I’ve also completed all the games I listed below, and highly recommend them too. 1. Fright CE (similar day time fright vibe) 2. Whispered Secrets: Everburning Candle CE (different storylines, and times of day) 3. Phantasmat: Reign of Shadows (similar story) 4. Mysteries of the Mind: Coma (older game, but my favorite story of any casual game ever played, with the exception of the Reincarnation series) 5. 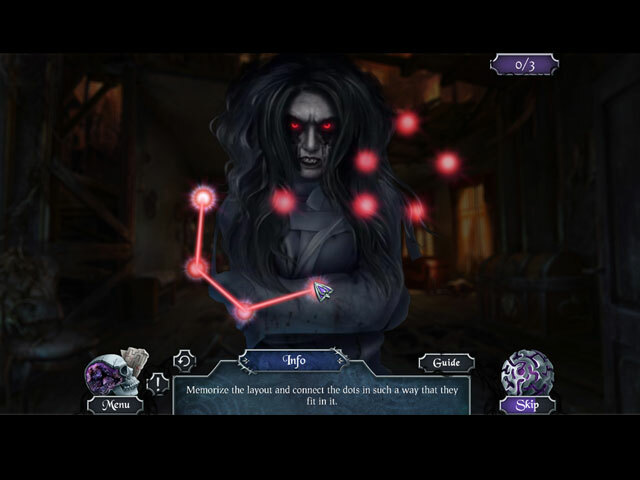 Haunted Hotel: Personal Nightmare (similar amazing jump scares) Thank you BFG, and each of you at Daily Magic who obviously worked very hard on this amazing game. I am such a huge fan of yours! Rated 5 out of 5 by elizadee from GREAT GAME!! Sable Maze did not disappoint!! I have all their previous games and did not hesitate to purchase this one, too. Loved the different ways HOS were presented and the puzzles were often challenging. The storyline was good and easy to follow. I will definitely play this game again and hope Sable Maze developers will keep them coming with this quality. Rated 5 out of 5 by Cookie827 from Loved this game I rarely write game reviews, but I absolutely loved this game. Puzzles were more challenging than the standard games and I really liked the story line. Nightmares, everyone has them and sometimes you get trapped by them. Rated 5 out of 5 by kgustavson from Loved every creepy moment! This was just a fabulous game and I enjoyed the heck out of it. Creepy factor is very high which I enjoy and the story line is great. HOS are varied from lists to FROGS to progressive and there aren't a ton of them. Graphics are of high quality and the puzzles aren't pull-your-hair-out difficult but appropriate to the game. And a wonderful Bonus game to boot. Well done!!! 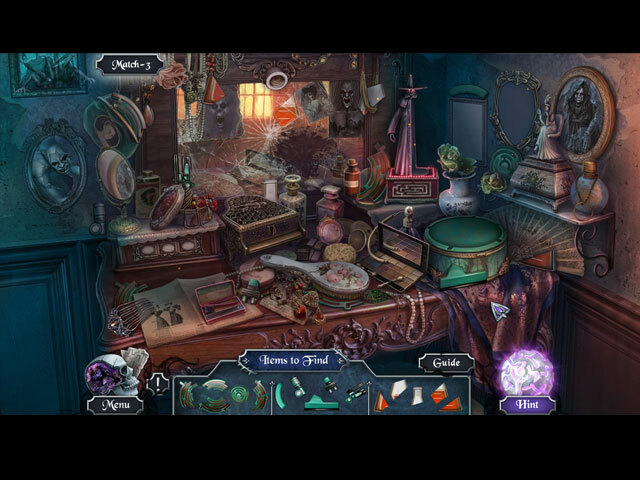 Rated 5 out of 5 by komarra from Is Excellent for hidden objects Please make some more those games so i can play them. Rated 5 out of 5 by greenshade from I adored this game including bonus. It was a long game for me, worth the wait and was lucky to get it on sale. I am not a puzzle person but there were quite a few mini games I enjoyed. Especially the one to make the bears fall to the bottom. The HOs were well crafted, interactive and FUN. (although Daily Magic does Match 3's are always fun and I wish I had had the option to do a Match 3 instead of some of the puzzles.) Sure was hoping to see a Match 3 game in extras but there was nothing in extras to play/replay. I enjoyed looking at the Developer's Diary and seeing the staff of Daily Magic looking all spooky. :) My favorite Sable Maze is still 12 Fears. Rated 5 out of 5 by pennmom36 from DON'T BE AFRAID OF YOUR OWN SHADOW, BE AFRAID OF OTHERS SHADOW Our minds tend to block terrifying events as a coping mechanism, to help us survive. Our dreams however, don't always get the memo, and sometimes we're forced to relive horrifying events of the past, events we've tried so hard to forget. On this fateful night, Reynell's nightmares come to fruition, as his dreams open portals of his past from Sullivan River to Norwich Caves, back to where his troubles first began. A nightmare filled with Shadows of those who haunt his life. It is said that a man who cannot find his deepest memories, will wake up, but what happens if he does find his deepest memory? I remember when Sullivan River was first released, and I bought the game without hesitation, and loved every minute of it. Since then, Sable Maze has had it's ups and downs, but I continue to enjoy this series, and Nightmare Shadows will definitely join my series collection. The characters are very realistic and have fluid movements (unlike the ones in Dark Romance that glide or walk with jilted movements) The graphics are decent, but tend to be a bit on the dark side. In this Collector's Edition version, there are Family Portraits to collect, and hidden Shadows to find. There are also Achievements to earn, some of which require playing HOP"s with the search penalty turned on. The Hidden Object Scenes are the same ole, same ole, however, I did enjoy some of the locations. There are items to find that match riddles, Fragment finds, Interactive Progressive Silhouetted Shape finds and even smaller Zoom Zones HOP's with Multiples. One of the scene's were repeated in the demo, which is a feature I really don't like, because its boring a second time around, but hopefully not too many scenes are repeated in the main game. There is an alternate Match 3 game available if you're not into HOP's. The Mini Games are fairly decent, so far nothing that's too difficult, and some are available with an Easy or Hard difficulty mode. Below are brief descriptions of some of the games you'll encounter during the demo: 1) Overlay a colored lens with the clear lens to scan for stepping stones, using the clues shown on each stone to choose the next colored lens. 2) Move figurines to their matching colored doors, moving a figurine will cause the others to move in the opposite direction. 3) Click rotational arrows and swap picture pieces along the lines to restore the 4 pictures. 4) Rotate circle sections until marbles align with all holes. 5) Find and replace torn book fragments correctly. 6) Use arrows to align two glass shards together. 7) Click on items to uncover fragments, if the selection is wrong, the items will shuffle. 8) Place tiles in their matching slots correctly. 9) Fold the map horizontally and vertically using visual clues on the map. 10) Use the map to find your way out of the maze. 11) Create a path for the ball to travel from left to right using directional arrows to move columns of tiles. 12) Arrange labels according to the timetable. 13) Defeat the shadow by selecting symbols in the scene that are shown in the top right corner. 14) Rotate the disks to swap the pieces to complete the picture. 15) Select and place the gears into the correct slots using the clues shown. SABLE MAZE GAMES AVAILABLE Title***Collector's Edition Release Date***Average Rating 1-Sullivan River (September 30-12) 4.0 2-Norwich Caves (August 29-13) 4.0 3-Forbidden Garden (July 24-14) 3.5 4-Twelve Fears (May 14-15) 3.6 5-Soul Catcher (December 31-15) 3.7 6-Sinister Knowledge (September 8-16) 4.2 7-Nightmare Shadows (September 9-17) n/a This Collector's Edition has 13 Developer Diary pictures, 18 Concept Art pictures, 12 Wallpapers, 15 Family Pictures to collect, 15 hidden Shadow People, 4 Music Soundtracks, 15 Achievements to earn, a built in Strategy Guide and a Bonus Chapter, enjoy the Shadows!